The Terracotta set, from the Artisan collection of melamine tableware, combines attractive colours and eye-catching design. This 12-piece set, made of 100% melamine, is extremely durable, lightweight and dishwasher safe. The Kampa Artisan tableware features irregular contours to create a rustic aesthetic and enhance your alfresco dining experience. Lightweight , strong and practical thes set will be ideal for your outdoor dining needs. 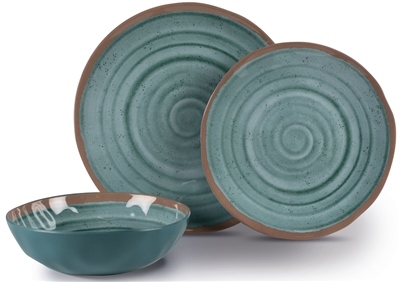 A great looking set, quite thick and some weight to them, its not until you pick them up that you realise their melamine, very pleased with my purchase, highly recomended.. This Dinner set is amazing it looks and feels like porcelain yet is really light ideal for our caravan trips. Arrived in good time from Camping world as usual. I'm really impressed with this dinner set. Looks very stylish and not at all cheap. Very good for the price.